Thank you to Stefano who designed and modelled Camelot for me. I just love it. I had fun adding the grass and birds and such. We’ll see a bit more of Camelot over the next few weeks. Since this technically counts as 2 pages. And since I’m still trying to catch up with life. I’m going to have this up for both days. New page on Monday. Introducing….Merlin. Don’t forget…we have FREE books for you to download. Have fun. And remember…every download is free to you…but pays us $.25! Thank you, and have a wonderful weekend! Yay! Merlin next week! Now I just can’t get Nicol Williamson’s voice out of my head now. He was the actor who played Merlin in the film Excalibur. Most of my Arthur stuff is based off of Excalibur. Why, thanks! I appreciate the complement! Oh, wait, you were talking to Scott, weren’t you. Love those Orff lyrics in Excalibur. Does make me wonder, though. Merlin is pretty much at the top of the wizard pantheon. Can he get himself or his spirit into Dreamland? Is that Merlin talking? I wonder: does he only know Nick from what Arthur tells him, or does he have additional ways of knowing about dreamland? Good that you put the date in the corner; that should settle the questions of when your Arthur lived. It may perhaps settle the questions as to when, but it doesn’t do too much to dissuade those of us who think it’s far too late to make sense based on when writings were made in the real world. I think it’s safe to say that it’s quite possible that what we have, even documents, could not be as accurate as we’d like. Considering that the New Testament is 99.99% accurately translated from the Greek documents we have (the .01% accounts for word variations that still carry the same thought, just with a different nuance) and yet people still would like to believe it wasn’t translated properly or that it contains errors regarding what actually happened, how much more likely is it that less reliable documents are not accurate- including those regarding Camelot? We have far more archaeological evidence to support the accuracy of the writings of Paul, Luke, Peter, and the other authors of the New Testament, and almost nothing for archaeological evidence to support Camelot’s existence. I think it’s quite possible that our understanding of Camelot is open to some interpretation since we don’t actually have nearly so much in reliable evidence to support when it actually existed. So, I think we can quite criticizing Scott on this point. But, I do admit, that’s my two cents on it. Although I live in the US, my last name is Jenkins and I have a Welsh flag up in my living room. “The bible” has been translated inordinate times since its initial gathering. Not so many generations perhaps (though Hebrew to Greek to English carries as many if not more chances for error than running something through Google Translate to the same extent), but since just about every translation was an attempt at exerting personal will and political manipulation, literal accuracy was hardly a priority. Conjuring a “99.99%” figure from thin air means little to nothing. Not that it particularly matters in the first place. “The bible” never contained anything of worth further than a warning regarding the sort of things one ought not to write. Never marry a woman made of flowers, for she shall stab you with a spear while you have one foot on a well and the other on a goat. I think it is Gwenevere talking. It just sounds like my mental feel for her voice in the various incarnations of the Arthurian legends. There’s a date in the corner? I’m guessing it’s been removed since, because I sure can’t see it. Maybe because Scott realised that there’s no way to fit Arthur into the 13th century without making major changes to history? But then why shouldn’t he? It’s a story after all, a fiction. Why should it be the same as our world? I’m pretty sure in our world children have been observed on an EEG, yet apparently this isn’t the case or else Nicole wouldn’t have freaked quite so much over Alex. Unless the lack of brain function is unique to him, not related to going to Dreamland. Heh, this stuff is probably all covered in the comments if I’d read them before posting this time. Well, as to the splash-page problem, us Firefox users can just right-click, select “View Image”, and it will show it in a new tab, so we can see it in all its lovely glory. I believe there’s a similar option for Internet Explorer “Show Image”, but I couldn’t get it to work, so I only know for sure the Firefox trick works. Also, let it not be forgot, that once there was a spot, for one brief shining moment that was known as Camelot! Keep that voice of Merlin in your mind… That guy ruled! Da da da da da DUH! We’re the knights of the round table! We dance whene’er we’re able! We do routines and chorus scenes and footwork in peccable! We dine well here in Camelot we eat ham and jam and spam a lot! We sing from the diaphragma looooooot. does anyone already knows the LEGO version, its even more hilarious. I LOVE the Lego version! I was just thinking about that today…glad to see someone else knows it! If you love that, then you should actually watch Monty Python And The Holy Grail. awesome sauce. Hah! I watched that exact clip four times last night. And Arthur needs to ask why other humans are frightened by camelot. And I understand Nic much better now. Imagine having to hear that song everytime Arthur and his knights fall asleep. If you own a mac, the newer ones come with an application called dashboard. Bring it up and download the free daily comics widget and then add The Dreamland Chronicles to your favorites. Then Ta-Da it shows you the full 2 page splash version. The speech balloon is actually sort of ironic when you think of the previous page and the art is stunning Scott! Once again you have created a masterpiece. I don’t know about the splash page – but this one stayed up! I dunno about anyone else, but… Splash page, for me. When I hover over it, it goes full-size; un-hover and it goes back. So, pretty cool. But there’s potential problems with the YouTube video deciding the stick it’sself over the top of the image if you’re not right at the top of the page. Looks like it’s working now. I moved some text up above the youtube video as it was somehow popping up over the larger image of the doube page splash. Yep, Flash is silly that way. At least in Chrome and Firefox (not sure about IE as I haven’t used it for browsing beyond necessity for many years), you can’t put anything on top of Flash objects. Flash always comes out on top. M-m-m-m! Mud baths Camelot at last! Wow, Stefano rocks! That is an excellent castle. I can’t wait to see Merlin, that should be fun. That’s hella beautiful. Awesome job. Beautiful page, and I am utterly gratified to see that Merlin is wise enough to implicitly distrust Nicodemus. Don’t forget to VOTE, everyone! Hey, I’ve been reading for a while now and I love your comic. I think the characters and the ideas are really well conceived. 🙂 I just have one small comment on today’s pages…and I feel kind of rotten making this my first comment…but, King Arthur, if he was real, would have lived much earlier than 1386. Quite a lot of the Arthurian literature was written in the twelfth century, and the stories had been in existence for a long time before that in the oral tradition. Tales like the Mabinogian and the Romances of Chretien de Troyes are some of the first written examples of Arthurian legend. Also, if you look at Geoffrey of Monmouth’s History of the Kings of Britain (assuming it’s remotely factual) Arthur would have probably lived anywhere from 650 A.D. to 1050. I don’t know if that’s at all important to your story…part of the great thing about Arthurian legend is that it’s so open to interpretation (Stargate, anyone?). But I guess I just can’t keep my mouth shut. 🙂 Keep up the fantastic work! Arthur actually is accepted by historians to have lived, and to have been a prominent ruler in England during the 600s. But I have to to state that he definatley wasn’t much, if any, later than that (maybe 700s) because the 600s is when the anglos/saxons/jutes moved in and set up a recorded monarchy. You can actually trace the historical kings pretty much from that point onward. Also, one other note is that Arthur would have been Gallo-Roman, not Anglo-Saxon. This means nothing for Dreamland though, it’s just something I find interesting. As mentioned a few pages back…I did some research (quite a bit actually) and also asked the fans. Go historical or mythical with Arthur. Overwhelmingly…the fans wanted to go the more chivalry and romance version. The one of the 1300-1400 stories. Like the movie Excalibur and most disney movies. I agreed…and worked it into the story. Honestly…from my research…I am led to believe that Arthur is an amalgam of many stories which grew into legend. I’m simply selecting the legend and timeline that works best for Dreamland. If Arthur actually had lived and ruled difinitively…I may have stuck closer to the source. Hope that helps. And thank you VERY much for talking about it. I love to chat about this stuff. See above. But I picked the legend that fit best with my story. Since they run from 500 AD to 1500 AD…I picked my favorite. Actually, are you sure the legends’ settings range from those periods? Most of the Romance Arthur seemed to be written in the 1000s and 1100s, from what I’ve seen. Later ‘writers’ supposedly just took what was written from those times and put them together. Suffice to say, the more fanciful versions came from the start of last millenium, not the middle of it. In an case, placing him in any period after the Anglo-Saxons established their dynasty makes him some random dude in the English countryside who built his own kingdom and somehow claimed to be King of the Britons while a real King was sitting on the Anglo-Saxon throne. Not very legendary or romantic…. But, yeah… like Bob said, being a nerd… at the very least a bit too nitpicky, that’s for sure. A good story should counter such. Aren’t there almost just as many different myths concerning Merlin’s origin too? I think I’ve heard of one where he’s the son of Lucifer himself, though I don’t really expect to see that version here. I have heard a little about that as well. I personally ascribe to the myth that Merlin is a half elf who learned to produce flashy and often incredible effects through what at the time was alchemy. Then again, the Arthurian legends rarely mentioned any interaction with the elves, and most of it in the form of placing blame for some thing like a bad crop, or breaking a bone, or some sickness, and so on. There are a few notable exceptions and possible exceptions, such as the Maiden of the Lake, the Fairy/Elven King (some stories claim he was a friend of Arthur through Merlin), occasionally Robin Goodfellow, known commonly as Puck the trickster, and a few “canon” stories that have come out more recently that have the elves/fairies/centaurs/dragons helping out a knight of Arthur’s Round Table. I am not going to bother predicting which “form” Merlin is going to take, but undoubtably it shall be an appearance worth remembering. On a different note I am not a big fan of Arthur… I love Gordon Dickson’s Dragon and the George and the rest of the novels in that series as well… I wonder what S. Carolinus would think of Dreamland… Or had he stopped by a few times for tea with the Elvish Kings… grinz enough rambling thank you again Scott!!! This image would make a lovely wallpaper… 😀 How about one without the speech balloon and text box as a vote incentive? The art is beautiful but the date at the bottom makes me want to tear my hair out. 586 A.D. would be more like it, if this is supposed to be Real England and the “actual” King Arthur. Either that or you’re going to need an explanation for why Richard II doesn’t have this guy locked up in the Tower of London with a dotted line around his neck (… medieval kings tended not to have too much of a sense of humor about pretenders to the throne). 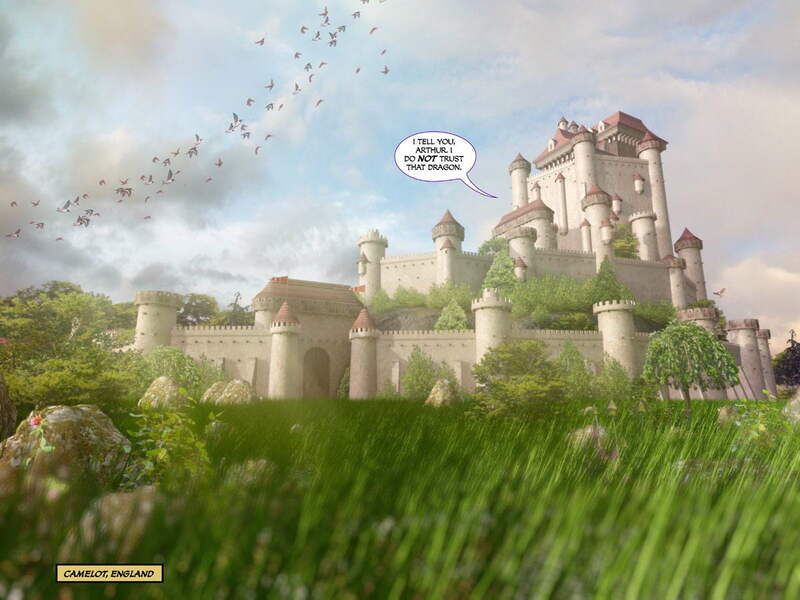 Even though you probably stated this several pages back, I still love how Astoria and Camelot are the same castles :). Aaahhh… how gorgeous! I’m sorry, I have to agree with the others. At the least put it before William the Conqueror. After just rings false. Thank you all for your insight into Arthurian legend. Some SAY he existed in the 400-500’s. Some say he existed later. The FACT is…Plate armor didn’t exist until the 14th or 15th century. They legend of king Arthur didn’t really gain all of it’s romance and magic until the 11th century or so. I have no problem moving it a bit here or there if there’s any real evidence to do so. But all of my research (and boy did I do a LOT of research) led me to believe that this legend would work pretty much anywhere from 400-1400 AD. For reasons that will be evident later…I chose the latter date. Thank you all again. And please feel free to input more. I don’t claim to know all of this. And I’m totally open to change. Plus, by putting this scene in the real world approximately 600 years in the past, that allows Dreamland years and real world years to coincide. Yes, between dreams, a variable amount of time transpires in Dreamland, but this way it roughly equals out over the long haul. For example, you might have only a few seconds pass in Dreamland between dreams one night, but it may be two days the next night. This seems preferable to tying “Arthur” to a well-documented period of British history: the King of England in 1386 was Richard II, about whom Shakespeare wrote his “Tragedy of Richard II”. There is not much room for a mythic or legendary king here, or in any of the history of England after the Saxon conquest (~600 AD). I suggest your setting be “The Dark Ages: Camelot, England”. That should be vague enough to match the “real” real world while still giving you storytelling flexibility. Hal Foster’s “Prince Valiant” comic has been running on that principle since 1937, with few (if any) complaints about what kind of armor the knights wear into battle. John Boorman’s “Excalibur” took the same approach: it was set in the time when “the one god drives out the many” (which would be in the late Roman period / early Dark Ages), but no one complained about their “fantasy armor” modeled on that of the late Middle Ages and early Renaissance. The problem is…and I don’t want to give much away…I need this to take place at least after 1,000 AD. It coincides with other historical things. Also…I’ve mentioned a 600 year rule a few times in the story to date. With regard to specific references to “600 years”, I think that might be the easiest to fix: a story continuity fix to change those references to “over 1000 years” unless this would require an even bigger deus ex machina to fix even bigger continuity problems. I can see where you could really start painting yourself into a corner by inserting more interactions with people/events from the “real” world: it seems to me that the story of Dreamworld Chronicles hangs on the reader’s acceptance that the Dreamworld and our world co-exist, just as the world of “Harry Potter” could exist alongside the “muggle” world without we muggles being any the wiser. Adding things that make the real world of the story seem real (e.g., Nicole has Daniel sign a waiver when Daniel wants to let Alex keep sleeping) help this, while it seems to me things that make the real world seem unreal (e.g., Arthur alive during the reign of Richard II) can do the opposite. I’m not sure why Arthur must reign after 1000 AD in order to preserve Dreamland’s story continuity, but the “Dark Ages” can be considered to have lasted from the decline of the Roman empire (5th-6th Century) to the Renaissance (14th Century): is that long enough to keep the Dreamland story intact? If not, is there any way to bridge from the time of Arthur to whatever historical interactions follow through use of the temporal elasticity that you have already shown between Dreamland and the real world? For example, in Chapter 2, Alex spends a whole day in the real world, while only 30 seconds elapses in Dreamland. Could you use this to mold “real world” time to match Dreamworld time as needed? Now to argue against the statement I made just above (so much for establishing my integrity), you have mentioned 600 years only in reference to Dreamland years. The readers don’t know how many days there are in a Dreamland Year, or even if a day/year in Dreamland equals a day/year in the waking world. Sure, they can reasonably assume that years are the same in both places, but their assumption could be incorrect. I agree. Time in Dreamland as opposed to our world doesn’t really seem to flow the same. Sometimes Alex can wake up and be gone for 30 seconds in Dreamland, other times the entire night, and when he and Felicity leap from Nick’s tower back in Chapter 5 or so (I own all three books so I’m more accustomed to when things happen in books as opposed to specific chapters) he wakes up with him and Felicity still falling, so who knows when exactly 600 Dreamland years would be in the past. It could easily extend to the 5th-6th century in our world. The Narnia books have an odd sense of time as well. The Pevensie children live long enough in our world to see Narnia not only exist for over a millennium but to see its end. As to all this arguing when Arthur should take place, I don’t know much about Arthur but from what I can tell, the Arthur in the 5th-6th century is more grounded in reality wheras the Arthur in the time Scott has listed features Merlin, Excalibur, and all the other fantasy elements that are present within the comic, so he is within his right to place Arthur in the 1300s. I like the idea of saying “England: The Dark Ages” for the time. That is a long enough range of years that you can really do just about anything in it with most people going along for the ride. Except, if Scott really wants (or needs) to put Arthur in the 1300s, that’s after the Dark Ages, which are usually said to cover about 476-1000. By 1100-1300 we are in the “High Middle Ages”. “On second thought, let us not go to Camelot: it is a silly place.” One of the funniest movies ever made. Monty Python simply knew how to write humor(though how you coudl fit Tim the Enchanter into the story would be a bit of a problem). NOW he does not trust that dragon. Man, I just spent the last three hours power-reading the entirety of this webcomic. I’m hooked, and a bit sad that I’ve reached the newest installment. MUST HAVE MOAR. MOAAARRRRRR. Don’t forget to drop by TWC and VOTE! I love this comic, totally agree that you shouldn’t dwell on the historical part too much… I believe the closest to the name Arthur comes the name of a local warlord, who fought under the name Arth (bear) which may have been combined with the Latin word for bear Ursis, I personally believe Arthurian legends are a combination of stories over centuries, caught by some very talented writers, who used their own creativity and artistic freedom to change times, weapons and for example the huge castles like famous Camelot, which is just what I’m seeing in this comic!! My many thanks to you Scott!! There is only one page. It’s a double page splash. Now that we can put the one pop up…I don’t have to do left and right anymore. You can see it all in one big double wide image. If you have an incredibly old browser like IE6, you will only see the left side. That’s my situation at work. If Merlin looks like a middle-aged Colin Morgan, then I will love you forever. Just saying. Seriously considering removing the date. If you check back and it’s gone…it’s due to all of this wonderful feedback. Ah, so maybe merlin casted the spell. Nic doesn’t seem like the spellcasting type. Now the only question is why was the curse cast? Perhaps Merlin saw Arthur’s evil scheme and tried to allow for Nic to rule dreamland without human kings. 1) We already know who was ruling England in 1386, and it wasn’t King Arthur. 2) One of the most important pieces of the Arthurian legend, Geoffrey of Monmouth’s “History of the Kings of Britain”, was written c. 1136. 3) King Arthur supposedly held off the Saxon invaders. By 1386, the Saxons had already ruled Britain for 400+ years and then been replaced by the Normans over 300 years previously. I don’t know how you could have done a lot of research into King Arthur and not be aware of those facts. To put this in an American perspective, imagine you’re writing a story similar to “The Patriot”, about a heroic American fighting against the Redcoats, and you want him to own a six-shooter. However, six-shooters weren’t invented until the 1800s, so you decide to move the date of your story forward to 1890. You haven’t solved the problem, you’ve just created a much bigger problem that’s impossible to ignore. That’s why so many people have been critiquing your date. It’s not because they don’t like your interpretation of the legends, it’s because a date of 1386 is impossible to reconcile with ANY interpretation. This is my take. All the time I’ve been reading this story I’ve been able to say to myself “this could be real.” Everything makes sense, it feels right. The story is there and works. I like that. Arthur around 1400 breaks me out of that feeling hard. I like being able to use my willing suspension of disbelief to get immersed in a story. I just cannot believe King Arthur near 1400. There is another King who would dislike having someone else claim his throne. Of course, that COULD be part of YOUR story. I don’t know. But IF Arthur is supposed to be the King of Britain Arthur rather than simply a duke with delusions of grandeur, the near 1400 year date just does NOT match our history. Now, in the end of course, this IS your story and you must decide what to do with it. I’ll be along for the ride either way. Note – Yes, I know that both Plate Armor (which I’m betting you have characters designed with and ready to show us) and true castles were NOT around during the age of the historical Arthur. But as Arthur’s Camelot was LOST it is not TOO difficult to just say that both were something that Arthur or Merlin or such and such made to promote the greatness of Camelot, and they were lost when Camelot fell. My father is a retired high school history teacher. He taught history (and geography, and a few other subjects) for about 35 years before retiring, and has been preaching to me about dates, times, facts and figures for the last 37 years. However, I would suggest that removing the date and going with a vague reference (“Middle Ages” would probably cover it to everyone’s satisfaction) will go along way to silencing all the whiners and naysayers and nitpickers making everyone happy (or at least coming as close as possible), while maintaining your continuity. Date? Who cares about dates? How can these people not be distracted by such gorgeous artwork?! not a fan of the mouseover enlargement. It makes scrolling down the page obnoxious. at least it will be gone soon. It also expands outside the borders of the screen and doesnt scroll horizontally well. They’re free for everyone. Did you register? I have to chime in on the dates here. 1386 is way too late, and broke me out of the story by a ridiculous amount. It would be like setting a story about WWI in the year 2009.